Once Upon A Time, let Ms. Gakell lead you on further…. 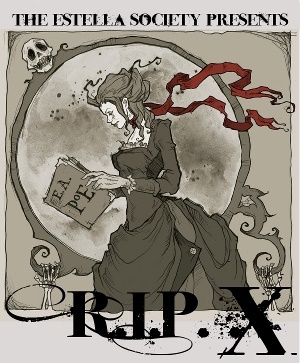 On this night after Halloween, it makes sense that I close my RIP IX readings with Elizabeth Gaskell’s “Gothic Tales” (Yeah!! I know I am day late, but with everyone going crazy with the “Halloween rage” thingy, it’s good that I did not pile on to already overcrowded bandwagon of Halloween celebrations). I state close, though I did mention in my RIP post that I would be reading 4, besides the read along is because my 4th book is completely untenable, unpalatable, un-everything!! If I thought “Rebecca” was OTT and “The Sign of Four” had a weird appraisal of women, then “Angelica” wins hands down on all that is unbelievable dumb, stupid and all kinds of unpleasant adjective. I could not go on beyond the 100 pages – there is not one bit of scare and I completely hated Angelica and the entire family. I am not sure if the book gets better later but I am no longer making an effort to find out. I am so thoroughly disappointed – I was really looking forward to Arthur Phillips’s work and it was such a letdown! Anyway, this post is about “Gothic Tales” and not “Angelica” which does not deserve even one sentence and I have already wasted 3! “Gothic Tales” is an anthology of all works mystery, gothic and horror genre written by Elizabeth Gaskell between 1851 and 1861, published mostly in Household Words and the Christmas special edition of All Year Round. Elizabeth Gaskell with her complete flexibility and virtuosity of the art weaves tales which are old legends like “Disappearances” as well as a ghastly ghostly tale of a secret marriage and a mysterious child that roams the freezing Northumberland in “The Old Nurse’s Tale.” There is an absolutely terrifying doppelgänger and threatens the future of the one person the witch who gave the curse loves in “The Poor Clare”. “Lois the Witch” is a sympathetic take on the young women accused of witchcraft in the Salem Witch hunt in 16th Century. Another sympathetic and heartbreaking novella is the “Crooked Branch”, a tragic tale of love gone awry. “The Doom of the Griffiths” is also a sympathetic narrative of loneliness, filial love and loyalty. Then there is “Curious if True” a fun and extremely weird narrative that includes all famous fairy tale characters including Cinderella, Sleeping Beauty, Puss in Boots, Beauty and the Beast etc. The other novellas include “The Squire’s tale” and “The Grey Woman”, stories about ruthless highway men and chases across countries. The book is a brilliant collection of all kinds of weird tales, some downright scary and others plain bizarre and yet others which points to utter foolishness of men and women in believing in stupid superstitious nonsense. Each tale is distinctive and is located in a different time and different geographies. We move between England, United States, Netherlands, Germany and travel between 17th to 19th centuries. These are not short stories but novellas and reading one does take time, simply because of the lovely details Ms. Gaskell has put in. Like a storyteller from old (I realize that she is from the old!!) she sits around the fire and tells you the story in a “once upon a time” style. There is no rushing, no get to the point in her tale, no breathtaking actions; but a slow meandering walk in which you follow her lead and suddenly you are in the middle of thick events. If you want fast paced adventure, she is not for you, but like a wine, if you savor this book slow, well get ready to sleep with the lights turned on!! This collection more than ever convinces me of the extreme brilliance of Ms. Gaskell – she is completely in her element writing a North and South and can turn her eye equally masterfully to satire; Cranford being the prime example. And now Gothic Tales is a testimony to the fact that an author need not really have a declared “genre” as long as he or she had a great tale to tell and knows how to create the atmosphere and evoke the reader’s imagination with use of words. Considering that this year, my RIP reads have been borderline, disasters, I am eternally grateful to the last Mrs. Elizabeth Gaskell and Ms. Shirley Jackson, from rescuing it from complete and utter annihilation! As part of the RIP 2014, The Estella Society organized a Readalong – The Haunting of Hill House by Shirley Jackson. While I was only planning to take part in Peril the First, but scrolling through Carl’s post I came across this reading event and I just had to be a part of it!! I had never read any works of Shirley Jackson before and I am usually skeptical of books that belong to the horror/supernatural genre. I am usually very disappointed in the endings of such genre and I do never feel even a twinge of fear and in fact find some plots absolutely laughable. However I had heard some great things about the The Haunting of Hill House and though I had not seen any of the movies based on this book, I knew it was rated very high among 20th century literature. It had been part of my TBD for a long time and the Readalong came as a great opportunity to finish at least one book out of the ever-growing list. The book opens with a description of the Hill House and Dr. James Montague has undertaken to conduct a study on the supernatural phenomena surrounding the house. He is joined in this investigation by three other members, two of whom he has himself picked – Eleanor Vance and Theodora along with Luke Sanderson who is the heir to the house. Dr. Montague on their first night at the house reveals that The Hill House was built by Hugh Crane who hoped his family would live in the house; however his first wife died while coming up to the house when her carriage crashed in the tree on the driveway and he lost his second and third wife as well. Hugh Crane’s two daughters were brought up in the house and the younger one married and the elder one continued living in the house with a companion, a girl from the village to whom she finally left the house. There were antagonism between the villagers and the younger sister versus the companion on this and soon the companion complained of thieving incidents and other such events in the house, before committing suicide. Since then anyone who has rented the house has never managed to complete the duration of their lease and have always moved away in a hurry. As the four participants settle in, events begin occurring in the house that disturb and threaten them. Soon Eleanor Vance begins to experience phenomena that others are oblivious to and slowly begins to lose grip on reality as she becomes subject to more such episodes. Finally concerned, Dr. Montague forces her to leave the house, though she resists such eviction. As she drives down the driveway, she crashes into the large oak tree. The characters in the book are minimalistically drawn but are very real. While the author does not spend to many lines in describing her protagonists, their actions bring out the nature of their character far more illustratively. There are some marvelously humorous events that take of some of the stress after the intense action and offer a much-needed relief in the chilling narrative. The star of the book naturally is The House – from the very beginning it dominates the plot line and all the other characters are just supporting this mammoth. It creeps and shudders and laughs and plays and thunders and booms making it well know that the house and the house alone is what matters and no one can tame or ever truly own it. The beauty of the book lies in the fact there is no blood or gore or horrifying monsters; but rather the use of subtle psychology and the feeling of things creeping behind you that makes it a terrifying read. There are no loud incidents, no clutching of throats or ghosts rising from the graveyard, but a far more petrifying phenomena – when one realizes that one alone is being subjected to supernatural things while others continue to live out their lives as normal. The understanding that you are holding the hand of a friend while sleeping only to wake up and realize it’s someone else’s hand or sitting in a room while something thunders and threatens to enter your room, a nameless horror, but never does, and you wait for it to come back again another night is truly terrifying and distressing. The book is SCARY!!! I am not someone who is usually daunted by supernatural plots, but for the last three nights, I have slept with the lights on!!!! !I am so glad that I read this book finally and I have to agree with Stephen King (whose books by the way I really dislike!) who wrote that this book was one of the finest horror novels of late 20th century! !